The club is run by a Committee of three people who are elected annually by the only formal meeting of the club. The Committee have the power to co-opt additional members for specific duties if required. The Club Rules are available here. We do occasionally attend other events in the area, these are announced to members via the Newsletter and Web Site. To find the origins of the club we will have to travel back to the early part of the 20th century, and take a trip down memory lane, Fortunately we have a member of the club (Chris Hinson) who was in contact with some of the early pioneers in the field of model engineering. Two such gentleman were Mr Maurice Reynolds, former proprietor of Renmodels of Cambridge, and Mr Don Unwin. Both of these gentleman were members of the Cambridge Model Engineering Society, although both these gentleman were in their 80s when interviewed they both had extremely good memories of the events leading up to the formation of the Cambridge Model Boat Club. 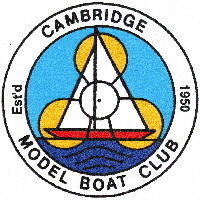 Don Unwin was of the opinion that Cambridge Model Boat Club was established between the years 1949-52 by some members of the original Cambridge Model Engineering Club, subsequent enquiries have suggested that 1950 is the most likely start date of the Cambridge Model Boat Club.